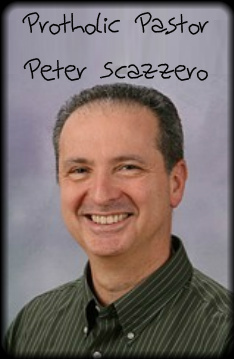 Recently in Peter Scazzero Try Silence here at Apprising Ministries I reminded you that well known compromised pastor Peter Scazzero joins with other pathetic Protholics like Purpose Driven Pope Rick Warren in defecating upon the blood of the Reformers. In that previous piece I told you that Scazzero’s shtick is sowing corrupt Contemplative Spirituality/Mysticism (CSM) ala Living Spiritual Teacher and Quaker mystic Richard Foster—and his spiritual twin Dallas Willard—within the mainstream of evangelicalism. 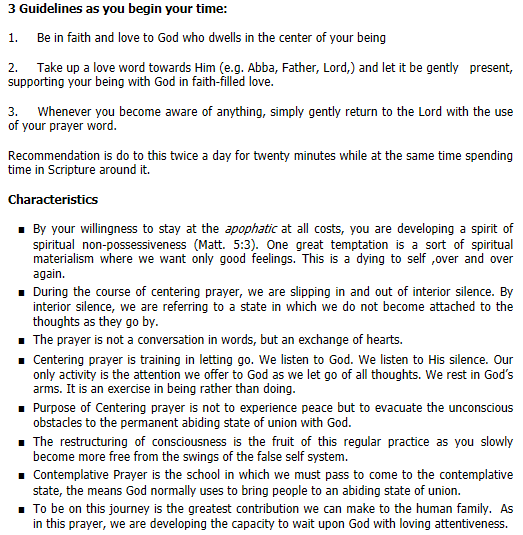 You need to know that Scazzero is partnered with the leadership of Bill Hybel’s Willow Creek Association and his CSM materials are being used within WCA to teach Contemplative/Centering Prayer (CCP), which is meditation in an altered state of consciousness. I seriously don’t know what it’s going to take to awaken evangelical leaders from their dead-on impression of Rip Van Winkle. This CSM nonsense has absolutely no place in the Protestant Christian community; and it isn’t even being taught by Protestants. Jesus never taught it and neither did His Apostles. Living Spiritual Teacher Thomas Keating and the late Spiritual Master Basil Pennington are apostate Roman Catholic monks; and you’ll see in Mainstream Evangelicalism Embracing Contemplative Mysticism that the “Rev.” Cindy Bourgeault, who’s a disciple of Keating, comes highly recommended by Brian McLaren. 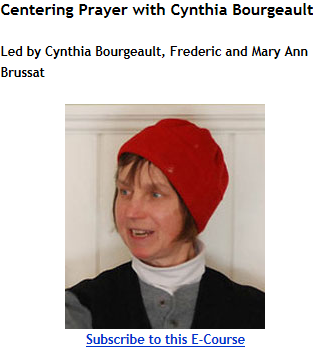 As a matter of fact guru Bourgeault’s set to lead an online spiritual retreat along with the unbelieving Frederic and Mary Ann Brussat—with whom I’ve had personal run-ins—for a whacked New Age website called Spirituality & Practice, which is the seedy spiritual source for that Living Spiritual Teachers Project. This is the source of CSM; it’s unbelieving mystics, not Christians. 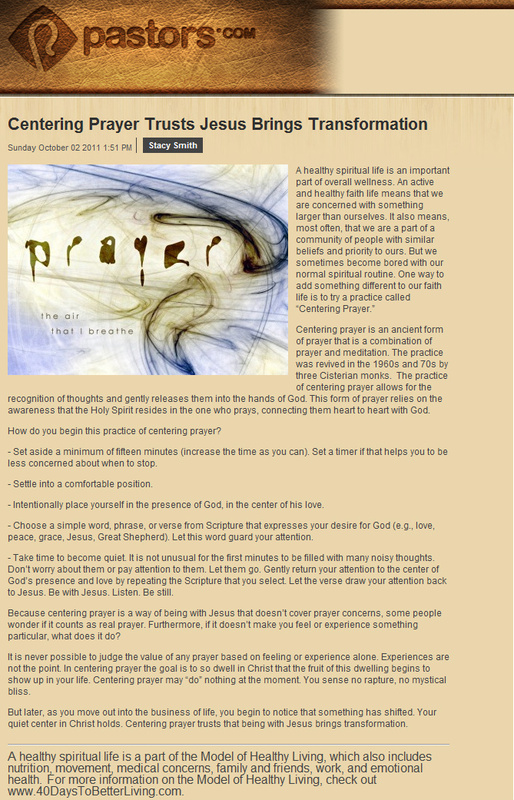 Scazzero goes on with his mystic mythology to try and get us to believe there are supposedly “2 primary ways of praying in the church.” No, there is only the way Jesus instructs us in Luke 11:1-4; and it involves being in a normal state of consciousness, and words. The so-called “apophatic” prayer refers to the crown jewel of CSM, the form of transcendental meditation aka CCP, which I mentioned above. In other words, it’s actually occultic divination according to God’s Word. History shows that CCP simply is not found in Christian circles until apostates left for the desert of Egypt. Romanticized monks and monkettes from the late third century now known as the desert fathers and mothers slithered into the desert and borrowed transcendental meditation from Hindus and Buddhists attempting to make a “Christian” form of it. It wasn’t until around 400 AD that John Cassian would bring it westward. It’s time for people to wake up here; look closely at what guru Scazzero, and that’s exactly what he is, is telling us when he says CCP is how we “enter into a deeper relationship with Jesus.” Can you see the clear implication here: Those who truly want to have a “deeper” relationship with God need to practice CSM and CCP. Supposedly guru Scazzero et al are the truly enlightened ones and those of us poor slobs who worship God through His prescribed means of grace are missing out on “really” knowing Him. No, we’re not; the fact is, they are actually dabbling in the occult. Scazzero then goes on to give us the standard CSM definition of CCP. This is mystic skubalon that’s merely Hindu mantra meditation lightly sprayed with Christian terminology. Yet this stupid true self/false self system of mysticism, which guru Scazzero teaches in his book EHC via Roman Catholic Thomas Merton, has TGC member Tim Keller’s stamp of approval. The critical question is: Why? Supervisor for Christian Formation in Wellness at the Church Health Center in Memphis, TN and Parish Associate at Idlewild Presbyterian Church. She has much experience in ecumenical and interreligious work, and a deep love for Scotland and interest in Celtic spirituality. Be that as it may, within hours of being exposed by online apologetics and discernment ministries the article openly teaching CCP suddenly vanished with no explanation. This is SOP for Rick Warren ministries; however, for those tempted to think it’s because of repentance, think again. Warren’s already a fan of Peter Scazzero. 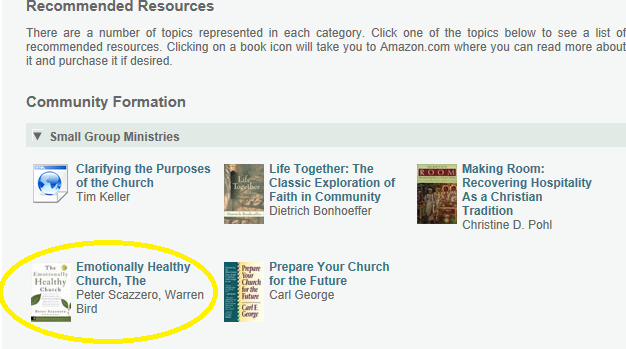 You can see that PDL Pope Warren—a most influential pastor in the SBC—is now openly encouraging CSM in articles like Contemplative Spirituality/Mysticism Invades Evangelicalism With Rick Warren And Kay Warren Leading The Charge; and his sinful ecumenicism in Rick Warren And Purpose Driven Roman Catholics. I just exposed, again, in “Inward Journey” Taught By Mystics Like Richard Foster Is Divination this mystic foolishness—diametrically opposed to sola Scriptura—has now heavily infected the Reformed sector of the church visible. We see it as New Calvinism’s Mark Driscoll Encourages Contemplative Spiritual Disciplines. Finally I going to illustrate for you just how much Peter Scazzero and these other Protholic evangelical CSM gurus are starting to sound like purveyors of the New Spirituality aka the New Age. Here’s living spiritual teacher and mystic Deepak Chopra as he muses New Age mythology in a bit of a Twitter sermon today. Nouns are illusions, there are only verbs. The universe is an activity, not a structure. “All that we are is the result of what we have thought”–Buddha. We are not observers of the universe but its co-creators. Thought divides. Silence unites. Every assumption separates us from reality. Ideas of reality are not reality. When all ideas are forsaken reality shines. When your life is natural, it will be effortless.